There is an established tradition of cardiovascular simulation tools, but the application of this kind of technology in the e-Learning arena is a novel approach. This paper presents an e-Learning environment aimed at teaching the interaction of cardiovascular and lung systems to health-care professionals. Heart-lung interaction must be analyzed while assisting patients with severe respiratory problems or with heart failure in intensive care unit. Such patients can be assisted by mechanical ventilatory assistance or by thoracic artificial lung. “In silico” cardiovascular simulator was experimented during a training course given to graduate students of the School of Specialization in Cardiology at ‘Sapienza’ University in Rome. The training course employed CARDIOSIM©: a numerical simulator of the cardiovascular system. Such simulator is able to reproduce pathophysiological conditions of patients affected by cardiovascular and/or lung disease. In order to study the interactions among the cardiovascular system, the natural lung and the thoracic artificial lung (TAL), the numerical model of this device has been implemented. After having reproduced a patient’s pathological condition, TAL model was applied in parallel and hybrid model during the training course. Results obtained during the training course show that TAL parallel assistance reduces right ventricular end systolic (diastolic) volume, but increases left ventricular end systolic (diastolic) volume. The percentage changes induced by hybrid TAL assistance on haemodynamic variables are lower than those produced by parallel assistance. Only in the case of the mean pulmonary arterial pressure, there is a percentage reduction which, in case of hybrid assistance, is greater (about 40%) than in case of parallel assistance (20-30%). At the end of the course, a short questionnaire was submitted to students in order to assess the quality of the course. The feedback obtained was positive, showing good results with respect to the degree of students’ learning and the ease of use of the software simulator. The e-Learning industry is developing at a fast pace. In the medical context, in particular, it is going to offer “face to face” classes, like those proposed in university rooms. Unfortunately tutors mainly employ static contents (e.g. PowerPoint or Word files or Virtual Learning Environments (VLEs) or websites). Such contents require no real interaction by the users . Simulators can increase the degree of interaction in health care education, for example by realizing a “virtual patient”, implemented by means of interactive computer simulations [1–3]. In this way the learner will take profit of a various range of learning activities. Other notable experiences include for instance Collaborative Tutoring Systems to determine clinical-reasoning skills of students . In this paper we present our experience of an e-Learning course realized using the numerical simulator of the cardiovascular system CARDIOSIM© . This interactive software is able to reproduce physiological and pathophysiological conditions of patients affected by cardiovascular and/or lung disease [6, 7]. In the simulator, several different ventricular pumps and devices was implemented in order to assist one or both ventricles in parallel or in series [8–11]. With respect to previous CARDIOSIM© version, thoracic artificial lung (TAL) assistance simulation was implemented too. This new version is also able to reproduce the cardiopulmonary pathological conditions of a patient and to study the interaction among the cardiovascular system, the natural lung and the TAL. During a training course held for graduate students of the School of Specialization in Cardiology at the Department of Cardiovascular, Respiratory, Nephrological, Anesthesiological and Geriatric Sciences (hereinafter CRNAGS Department), “Sapienza” University of Rome, heart-lung interaction was studied when thoracic artificial lung assistance was applied. Heart-lung interaction must be analyzed when patients with heart failure or with severe respiratory problems are assisted in Intensive Care Cardiac Unit. Some pulmonary diseases can be the result of haemodynamic pathology, most notably an increase in pulmonary vascular resistance. In these cases the right ventricle (RV) is overloaded and cardiac output is reduced to problematic levels. In many pulmonary diseases, both gas exchange and haemodynamic disturbances are present to some degree. Therefore an accurate analysis of the heart-lung interaction must be done in those patients with severe respiratory problems or with heart failure . Chronic respiratory failure or severe pulmonary infections can be treated using thoracic artificial lung that do not use a pump  but rather can be attached to the natural lung (NL) in series, in parallel or in hybrid mode . reduces mean pulmonary arterial pressure. All students’ simulations have been performed in an interactive way. By interacting with the tool, students were able to put into practice concepts learned during their previous studies. Sometime they made mistakes that have been highlighted by the simulator. By simulating an inappropriate drug administration, students have been able to verify how the conditions of the virtual patient worsened. During our experience, it has been proved that cardiovascular interactive software simulator can be a useful tool for studying and training cardiologists, anaesthesiologists, nurses and medical graduate and undergraduate students in the management of mechanical circulatory and ventilatory devices [15–17]. 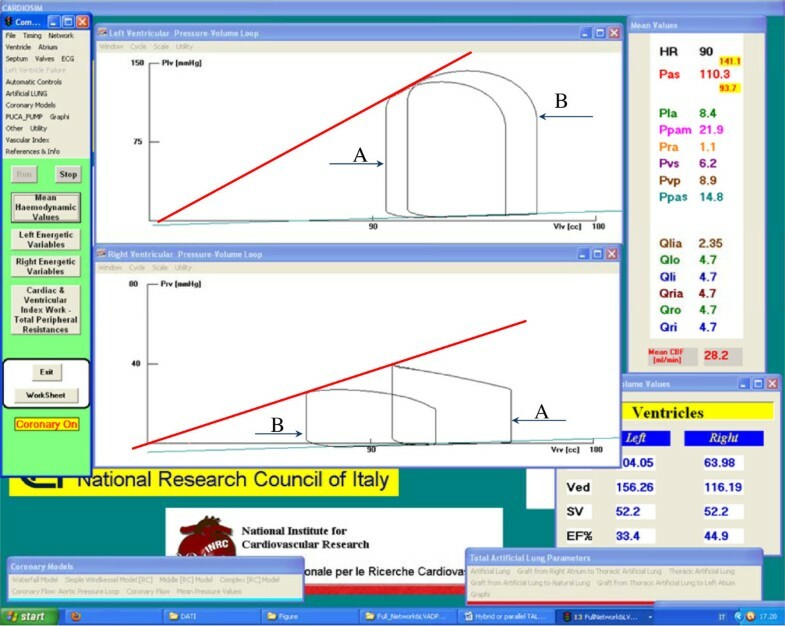 The software simulator developed by the Institute of Clinical Physiology of the Italian National Research Council is able to reproduce pathophysiological conditions of patients affected by cardiovascular and/or lung diseases. The simulator implements many different cardiovascular pumps in order to assist one or both ventricles in parallel or in series way [6, 8–10]. The blood pump implemented can reproduce pulsatile or continuous flow. The lung assistance is realized by a new software module implementing a thoracic artificial lung. TAL can be connected to the NL in parallel, in series and in hybrid mode [14, 18, 19]. CARDIOSIM© has a graphical and a numerical interface which shows the instantaneous waveforms during the cardiac cycle and the mean values of pressures, volumes and flow. The training course, held for graduate students, consisted of different exercises in which the pathophysiological conditions of patients hospitalized in CRNAGS Department were reproduced using the interactive software simulator. In this paper we describe our experience gained during the simulations cycle held in a classroom with 25 students. Each pair of students was equipped with a workstation on which the CARDIOSIM© software was installed. The exercises were focused on the study of the effects induced on some haemodynamic variables by the heart-lung interaction in presence of TAL assistance. Figure 1 (panel A) shows the software interface used during the e-Learning course relative to a first level of choice that permits to select different districts of cardiocirculatory network, different mechanical assist devices and different mechanical ventilatory assistance. Panels B and C show two different possible networks choose. Starting from baseline conditions, reproducing the pathological conditions of hospitalized patient, the effects of different TAL assistances (in parallel and hybrid mode) were reproduced by changing TAL compliances and resistances [13, 14], in presence of different pulmonary vascular resistance values. The selection of patients undergoing this type of therapy had been previously carried out by the students on the basis of an ontology based on the evaluation of measured haemodynamic parameter values. Software interface used during the e-Learning training course. Window [A] represents a first level of choice that permits to select among different districts of cardiocirculatory network, different mechanical assist devices and different mechanical ventilatory assistance. Panels [B] and [C] show two different possible networks choose. In panel [B] is represented a network with a simple implementation of systemic and pulmonary arterial sections and with a parallel pneumatic left ventricular assist device (LVAD). In panel [C] is represented a network with a complex implementation of systemic and pulmonary arterial tree and with “in series” rotary left ventricular assist device (Hemopump). The overall modular configuration of the software simulator is reported in Figure 2. Each block of the circulatory network can be implemented as combinations of “n” different sub-blocks. The generic block (or sub-block) can be implemented using different combinations of the three electrical networks reported in figure. Each block (or sub-block) has two inputs and two outputs representing flow (Q) and pressure (P). Panels B, C of Figure 1 are two possible circulatory network representations obtained starting by the configuration presented in Figure 2. In this figure also mechanical assist device (MAD) and thoracic artificial lung are represented as block having two inputs and two outputs. This kind of assistances can be connected to the circulatory network in different way (e.g. MAD can be connected in series or in parallel to both ventricles). All single sub-blocks of the network can be implemented using one of the three electrical representations realised by resistance (R), inductance (L) and compliance (C). Each sub-block can be implemented numerically by first-order partial differential equations. In the software simulator, the entire equation system is solved by Euler’s method. Overall modular configuration of the software simulator. Each block of the circulatory network, enclose “Mechanical Assist Device” and “Thoracic Artificial Lung” blocks, can be implemented as a combinations of “n” different sub-blocks. The generic block (or sub-block) can be implemented using different combinations of the three electrical networks A, B, or C realised by resistance (R), inductance (L) and compliance (C). Each block (or sub-block) has two inputs and two outputs representing flow (Q) and pressure (P). CARDIOSIM© configuration used during the course held for the graduate students of the CRNAGS Department is reported in Figure 3 (Table 1). 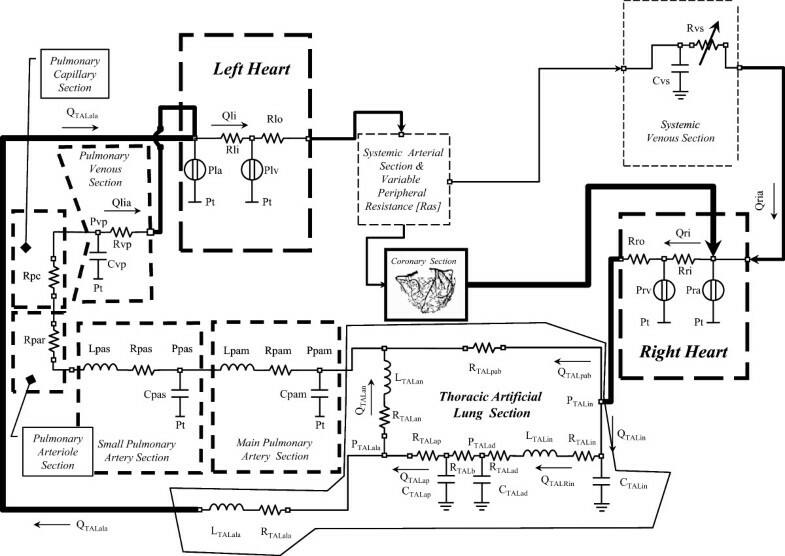 The electrical analogue of the cardiovascular system (CVS) shows the left and right ventricles (atrium), coronary section, systemic arterial and venous sections, main and small pulmonary artery sections, pulmonary arteriole and capillary sections, pulmonary venous section and thoracic artificial lung section. Electrical analog model of the cardiovascular simulator including the thoracic artificial lung. The cardiovascular model is divided in the following sections: left (right) heart, systemic arterial section (with variable peripheral resistance), systemic venous section, main (small) pulmonary artery section, pulmonary arteriole (capillary) section, pulmonary venous section and coronary circulation. TAL assistance is connected between the input to the pulmonary artery and the natural lung/left atrial section. Table 1 summarizes pressures, flows and RLC elements. Systemic arterial section was reproduced using a modified windkessel with a variable peripheral resistance [6, 25]. Systemic venous section was implemented by compliance and variable resistance [7, 9, 25]. Main and small pulmonary artery sections were reproduced by RLC model [14, 26, 27]. Pulmonary arteriole and capillary sections were modelled by a single resistance . Pulmonary venous section was reproduced by RC element [26, 27]. The behaviour of the coronary network was implemented by lumped parameter model based on the intramyocardial pump concept [11, 28–30]. The electrical analogue of the new module implemented into CARDIOSIM© software is shown in Figure 3. TAL assistance can be connected to NL in “series mode”, in “parallel mode” or in “hybrid mode” (Figures 3 and 4) [14, 18, 19]. In “parallel mode” the blood flow is routed from the pulmonary artery through the TAL and then returned to the left atrium (Figure 4). This configuration reduces impedance of the TAL and natural lung system. In “series mode”, the blood flow is routed from the proximal pulmonary artery through the TAL and then back to the distal pulmonary artery, where the blood then flows through the NL and finally back to the left atrium (Figure 4). In “hybrid mode” the blood flow is routed in part to the NL through the TAL and in part to the left atrium through the TAL (Figure 4). Shows the possible TAL connections: parallel mode (upper panel), in series mode (central panel) and hybrid mode (lower panel) . In all connections TAL assistance takes blood from pulmonary artery. 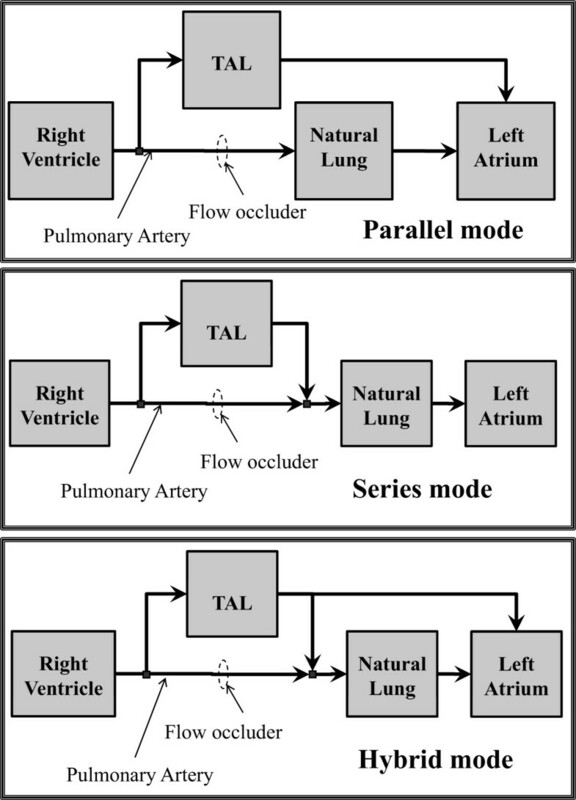 In parallel (in series) mode TAL ejects blood into left atrium (natural lung). Finally in hybrid connection TAL ejects blood in both natural lung and left atrium. In this last connection the amount of blood ejected into the natural lung depends from the value of resistance RTALpab (Figure 3). In the numerical simulator, TAL was implemented using a lumped parameter model (Figure 3). Five parameters (RTALap, RTALad, LTALap, LTALad and RTALb) were used to model the TAL assistance. Hybrid TAL configuration is realized connecting the pulmonary circulation through the resistance (RTALpab) and linking the left atrium through the RL elements (RTALala and LTALala). In “series mode” was implemented setting the resistances RTALpab and RTALala to infinity value. Parallel TAL configuration was realised setting the resistance RTALan to infinity value. 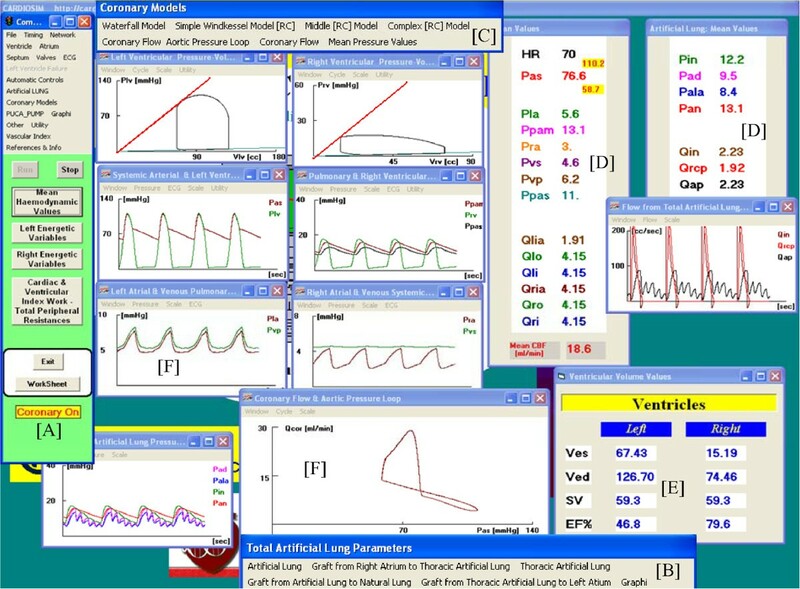 Figure 5 shows the interface windows presented to students during some phases of a tutorial in which a simulated pathological patient was assisted by means of a TAL device. The figure shows some of the possible “command boxes” (e.g. “principal” command box (panel A) in the left side, “thoracic artificial lung” (panel B) and “coronary model” (panel C) command boxes. In “principal” command box (panel A), users can perform a second level of choice for the representation of some circulatory districts. In addition, by using this box it is possible to change network, ventricular and atrium parameters, and also to choose different graphical representations and to store parameters and numerical waveforms values. “Thoracic artificial lung” box (panel B) presents commands to set “ON/OFF” TAL assistance, to change TAL configuration (parallel, in series and hybrid) and its parameter values and to show the waveforms of pressure and flow of the TAL. Finally “coronary model” box (panel C) presents command to set “ON/OFF” four different models of coronary circulation. Coronary network is assembled according to the same principle described in Figure 2. This last command box (panel C) permits to change coronary parameter values and to show pressure and flow waveforms in different coronary districts. Panels D and E (Figure 5) show mean pressure, volume and flow values calculated during the cardiac cycle. Interface windows presented to the students during some phases of an exercise which was held during the training course. Panel A represents the “principal” command box, panel B the “thoracic artificial lung” command box and panel C the “coronary model” command box. Users can perform a second level of choice for the representation of some circulatory districts from panel A. In addition using this command box it is possible changes network, ventricular and atrium parameters, it is possible choose different graphical representations and to store parameters and numerical waveforms values. Panel B presents commands to set “ON/OFF” TAL assistance, to change TAL configuration and its parameter values and to show the waveforms of pressure and flow of the TAL. Finally panel C presents commands to set “ON/OFF” four different representation of coronary circulation. Coronary network is assembled according to the same principle described in Figure 2. Panel C permits to change coronary parameter values and to show pressure and flow waveforms in different coronary districts. Panels D and E show the mean pressure, volume and flow values. In all other windows (F) the instantaneous pressure, volume and flow waveforms calculated in the various districts of the network are plotted. In the different windows (F) the instantaneous pressure, volume and flow waveforms in correspondence of different cardiocirculatory districts are plotted. The training course on the interaction of cardiovascular and lung systems was held for 25 graduate students of the School of Specialization in Cardiology and consisted in 8 two-hour sessions. During such sessions, cardiocirculatory pathological conditions of patients have been reproduced. The reproduced conditions were comparable with those measured on the patients analyzed and described in our previous papers [7, 10, 11]. The patients selection were done on the ontological concept basis applied on haemodynamic measured variables. By using the numerical simulator, the students simulated various drug therapies aimed at improving the patients’ cardiocirculatory conditions . The training course took into account also pathological cardiocirculatory conditions which, in order to be solved, need: ventricular assist devices (VADs) [6, 8, 9], intra-aortic balloon pump (IABP) , biventricular pacemakers , mechanical ventilatory assistance [8, 9] and so on. In these kinds of exercises students use ontology in order to choose the mechanical circulatory support systems which best suits to solve the simulated patient’s pathology . In the following we describe a case study carried out during the seminars. Using data measured on patients (admitted to the CRNAGS Department), students reproduced a pathological condition that induced the following effects on the haemodynamic variables: an increase of right ventricular end systolic volume, an increase of right ventricular end diastolic volume and an important increase of pulmonary arterial pressure. Starting by these circulatory conditions (baseline conditions), the experiments were divided in different steps. In the first step parallel TAL assistance was applied, and the pulmonary arterial peripheral resistance was set to 240 [g·cm-4·sec-1], TAL compliances were set to CTALin = 1.5 and 0.4 [ml/mmHg] and CTALad = CTALap = 2.0 and 0.1 [ml/mmHg]. This high value of pulmonary resistance induces an overload in the right ventricle. By imposing such a high value, only TAL device induces some effects on the cardiopulmonary circulation. In the second step the same simulations were performed setting pulmonary arterial peripheral resistance to 120 [g·cm-4·sec-1]. This low value of pulmonary resistance (induced by drug administration) permits to download the right ventricle. By imposing such a low value, students can observe the double effects induced by TAL assistance and by the administration of drugs that improves pulmonary circulation and download the right ventricle. Finally in the third step, the same simulations were reproduced for the hybrid TAL assistance. Different combination of TAL compliances permits to evaluate the performances of the assistance . In all simulations, conduced in interactive mode, the analyzed variables were: left ventricular end diastolic volume (LVEDV), left ventricular end systolic volume (LVESV), right ventricular end diastolic volume (RVEDV), right ventricular end systolic volume (RVESV), cardiac output (CO), mean pulmonary arterial pressure, mean left atrial pressure, mean systemic venous pressure and the value of the area of coronary blood flow-aortic pressure loop (CBP-AoP) [11, 33, 34]. The mean values were calculated during the cardiac cycle. At the end of the training course, a questionnaire was submitted to students in order to evaluate the quality of the training course. The evaluation of the answers provided by students is reported in the next section. Such a precious feedback gave us an indication of the quality of CARDIOSIM© and it will allow us to focus even better on users’ needs in the future releases of the tool. Figure 6 shows results obtained in the conditions described in the first step of “Experimental method” section. Starting from the application of baseline condition, students applied the TAL assistance in parallel and hybrid model using the numerical simulator. 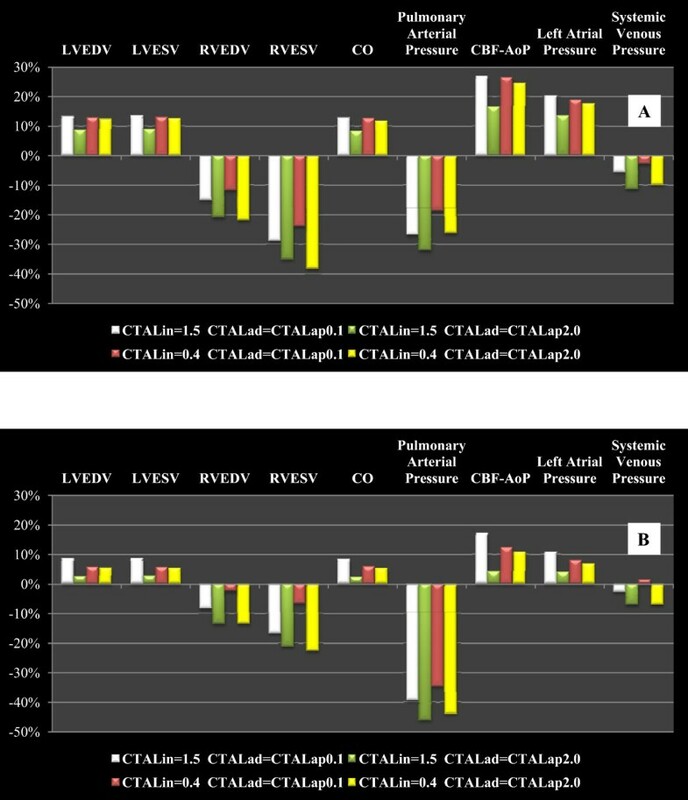 In Figure 6, panel A shows the percentage changes obtained applying the parallel TAL assistance and setting pulmonary arterial peripheral resistance to 240 [g·cm-4·sec-1]. TAL assistance reduces RVEDV and RVESV, but increases LVEDV and LVESV . The reduction of RVEDV and RVESV allows the right ventricular pressure-volume (P-V) loop to move to the left in the pressure-volume plane . According with literature data, parallel assistance can produce an increase in cardiac output [37, 38]. A reduction of mean pulmonary arterial pressure and an increase of CBF-AoP area have been produced by parallel TAL mode. In this tutorial, students have verified that parallel attachment can significantly reduce pulmonary pressures and unload the right ventricle [38, 39]. Panel B shows the effects induced by hybrid TAL assistance when peripheral resistance was set to 240 [g·cm-4·sec-1]. Percentage changes produced by parallel TAL assistance (panel A) on left/ right ventricular end diastolic volume (LVED/ RVED), left/ right ventricular end systolic volume (LVESV/ RVESV), cardiac output (CO), mean pulmonary arterial pressure, coronary blood flow- aortic pressure (CBF- AoP) area, mean left atrial pressure and mean systemic venous pressure. In panel B are reported the percentage changes induced by hybrid TAL assistance. These results are obtained starting from baseline conditions reproduced by measured values on hospitalized patient. The selection of the patient undergoing TAL assistance has been carried out, previously, by the students on the basis of ontological concepts based on the evaluation of haemodynamic measured parameter values. During the simulations pulmonary arterial peripheral resistance was set to 240 [g·cm-4·sec-1]. In both panels we reported results obtained for different values of TAL compliances. Students using different combinations of TAL compliance values verified the different effects induced on haemodynamic variables [13, 40]. The percentage changes induced by hybrid TAL assistance on some haemodynamic variables are lower than those produced by parallel assistance. Only in the case of the mean pulmonary arterial pressure, there is a percentage reduction which, in case of hybrid assistance, is greater (about 40%) than in case of parallel assistance (20-30%). Finally, students have observed that TAL assistance increases the mean left atrial pressure, as described in literature . Figure 7 shows one of the different screen outputs produced by students during the training course. In the central windows there are plotted the left ventricular (upper) and the right ventricular (lower) P-V loops . In Figure 7, students reproduced the evolution of the left and right ventricular P-V loop, when TAL assistance was applied in parallel mode starting from a baseline condition. By analysing the figure, it is possible to observe how the left ventricular pressure-volume loop moves to the right (increasing LVEDV and LVESV) in the P-V plane (upper window) from position A (baseline conditions) to position B (assisted conditions). The right ventricular P-V loop (in lower window) moves towards the right side in the P-V plane from position A (baseline conditions) to position B (assisted conditions). This effect produces a reduction of RVEDV and RVESV and an increase of right ventricular efficiency. Possible screen output produced by student during the training course using the interactive CARDIOSIM © software. Starting from baseline conditions the applications of parallel TAL assistance induces a shift of both left (upper window) and right (lower window) P-V ventricular loops. Right P-V ventricular loop shift from A (baseline conditions) to B (assisted conditions). Left P-V ventricular loop shift (in the right side) from A to B. In the right box are reported some haemodynamic mean (calculated during the cardiac cycle) values assumed during the parallel TAL assistance. Figure 8 shows the percentage changes of some haemodynamic variables when the pulmonary arterial peripheral resistance was set to 120 [g·cm-4·sec-1] in order to reproduce the effects of drug administration. Panel A shows the percentage changes when parallel TAL assistance was applied. 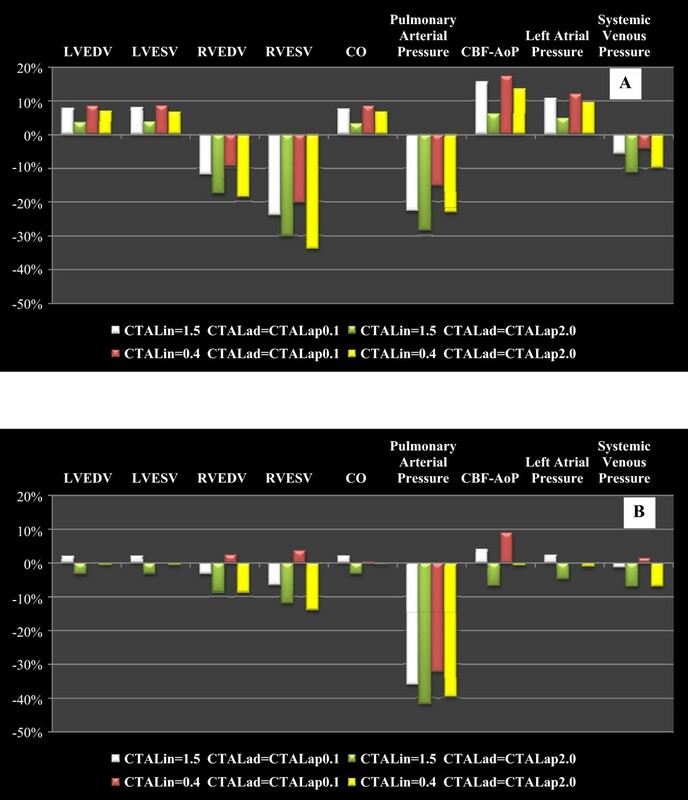 The trend presented in Figure 8 (panel A) is the same presented in Figure 6 (panel A), but the percentage changes on CO, CBF-AoP and mean left atrial pressure are more relevant in this second figure. Percentage changes on LVESV and LVED (panel A) are higher in Figure 6 than in Figure 8. As far as hybrid TAL assistance is concerned, panel B of Figure 8 shows an opposite trend (with respect to panel B, Figure 6) for the percentage changes in some variables in correspondence with some combinations of TAL compliances value. This phenomenon occurs in LVESV, LVEDV, RVESV, RVEDV, cardiac output, mean left atrial pressure and in CBF-AoP area. The reduced pulmonary peripheral resistance value during hybrid TAL assistance apparently does not affect percentage changes in LVESV, LVEDV, CO and mean left atrial pressure.The cardiac output is one of the variables on which researchers focus attention during TAL assistance. Results presented in Figure 9 have been also obtained during the training course held for students of the School of Specialization in Cardiology at the CRNAGS Department. In this figure we present the percentage changes (with respect to baseline conditions) of CO when TAL assistance was applied in different mode, with different pulmonary arterial peripheral resistance values and with different TAL compliance values. Percentage changes produced on haemodynamic variables by TAL assistance when pulmonary arterial peripheral resistance was set to 120 [ g · cm -4 ·sec -1 ]. Panel A (B) shows the percentage changes when parallel (hybrid) TAL assistance was applied. These results are obtained starting from baseline conditions reproduced by measured values on hospitalized patient. The selection of the patient undergoing TAL assistance has been carried out, previously, by the students on the basis of ontological concepts based on the evaluation of haemodynamic measured parameter values. 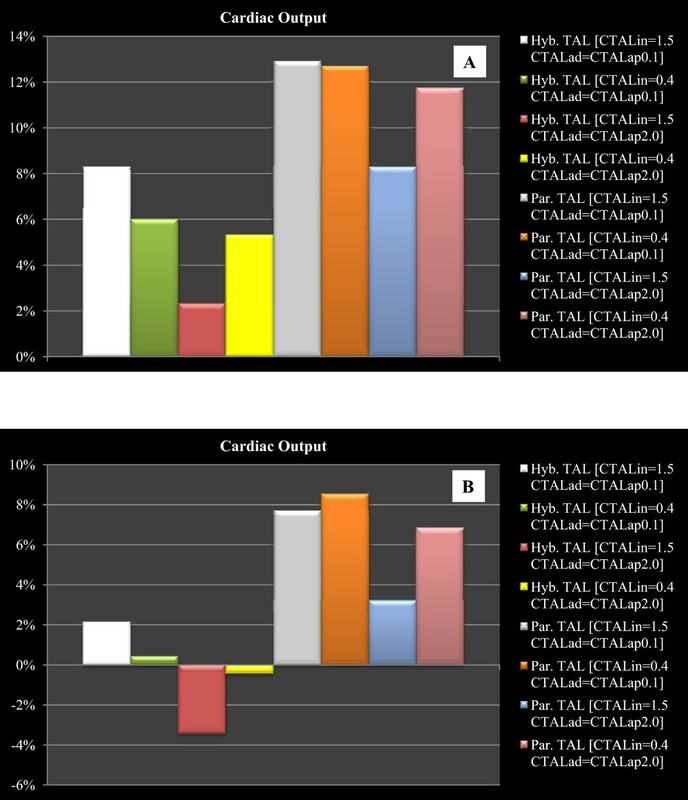 Percentage changes produced on cardiac output by different TAL assistance when pulmonary arterial peripheral resistance was set to 240 [ g · cm-4 · sec - 1 ] (panel A) and to 120 [ g · cm - 4 · sec - 1 ] (panel B). In both panels students obtained the percentage changes setting (in the interactive human numerical simulator) different TAL compliance values. During the assistance compliances were set to CTALin = 1.5 and 0.4 [ml/mmHg] and CTALad = CTALap = 2.0 and 0.1 [ml/mmHg]. Panel A (pulmonary arterial peripheral resistance was set to 240 [g·cm-4·sec-1]) emphasizes that, in the case of TAL parallel assistance, independently from the values assumed by TAL compliances, cardiac output is more or less double with respect to hybrid assistance. Panel B (pulmonary arterial peripheral resistance was set to 120 [g·cm-4·sec-1]) shows that parallel TAL assistance causes an increase in CO, whereas hybrid assistance can yield into a reduction in CO .
12% claimed to have had a low degree of learning. The majority of students (88%) assessed software easy to use, while 12% of them experienced difficulties in navigating among the various alternatives offered by the simulator. Interactive numerical simulators permit to plan for the learner exercises where he can make mistakes without jeopardizing the health of the patient or animal . The same exercises can be reproduced an unlimited number of times. Additionally CARDIOSIM© software allows to store specific situations in order to continue in later times the study that you are performing. The possibility to create a large number of data files from which learner can start to study the various therapies that can be administered to the virtual patient, allows to realize a database that can be indexed using an ontology of cardiovascular concepts [42–44]. During the described course, in same cardiocirculatory conditions, students applying TAL assistance induced an increase of LVEDV, LVESV and a reduction of CO. These results induced a decrease in the left ventricular efficiency. In order to improve the left ventricular conditions a possible chooses consisted to help the left ventricle with a mechanical circulatory assist device. 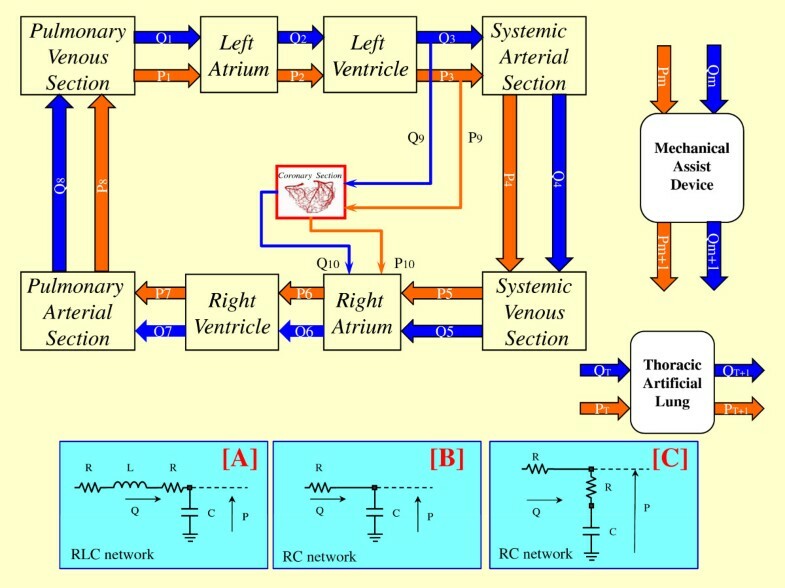 To choose the better mechanical circulatory assist device according to the virtual patient pathological conditions, students were assisted by an ontology applied to mechanical circulatory support systems . In general, the interactive simulator can also be used to teach and practice the management of complex perioperative medical events and emergencies . The cardiovascular system is very complex and is characterized by the presence of numerous control mechanisms that can occur under certain conditions. A limitation in the use of these simulators is linked to the impossibility to reproduce the behaviour of the entire CVS and its control mechanisms in the various circulatory conditions that may arise. Over the years, researchers have developed several numerical models of the CVS. Each model, developed in a more or less complex mode, has the characteristic to be rigid and not flexible since it was developed according to the type of study and/or experiment that the user wanted to perform [47–52]. CARDIOSIM© has a different approach: it is a peculiar software platform with unique characteristics that we sketch out in the following. First of all, unlike other in silico simulator [53–57], it is based on a modular approach and it is equipped with a library of numerical models of the various sections of the CVS. The library can be increased with other numerical models and can be continually updated. The various models can be easily assembled, from researchers, teachers or students, among them according to the experiment that the user wants to reproduce. This is a first feature that distinguishes CARDIOSIM© from other models that despite being already available in the network, do not have the flexibility that is required to adapt to the type of pathology experiment that the user want to study. For each set of parameters, CARDIOSIM© permits to choose an initial set of values inside libraries that contains also patient or animal measured value parameters. The software simulator allows to save in Excel format the numerical values of the various waveforms reproduced during the simulations. In this way it is possible to do any kind of “off-line” analysis. Another peculiarity of the software platform is the possibility of using several ventricular assist devices reproducing continuous or pulsatile flow. These VADs can be connected in series or in parallel mode to the left or right (or both) ventricles. VADs implemented in CARDIOSIM© are pneumatic or rotary blood pump (i.e. Hemopump HP31 , PUCA pump ). Each VAD can be synchronized or not synchronized with the heart’s electrical activity or can operate in “full-empty” mode. Also intraaortic balloon pump (IABP) and biventricular pacemaker devices can be used with the numerical simulator when pathological conditions are simulated. Unlike the previously presented tools, our software platform allows to choose among different types of mechanical ventilatory assistance when VADs, IABP or biventricular pacemaker are applied or not. This option allows to study the effects produced on haemodynamic and energetic variables by the interaction among the CVS, VAD and MVA or TAL. a limitation of our simulator lies the fact that its use is not intuitive and presents difficulties for students not familiar with IT tools. An e-Learning environment can take profit from the employment of a software simulator such as CARDIOSIM©. Among the advantages of using a simulator, we have to consider that the same pathophysiological conditions can be replicated several times by the students without any damage for the virtual patient. Currently, the e-Learning tool that we implemented is used in a local environment in a traditional face-to-face interaction between teachers and students. In the future, we plan to extend the e-Learning features in a telematic virtual environment by means of an internet based platform. We also believe that not only simulation software, but also an ontology-based modelling of the relevant concepts involved in the e-Learning domain is a valid approach in order to reuse an environment in other domains or for other students’ profiles (e.g. general practitioners, anesthesiologists, nurses). 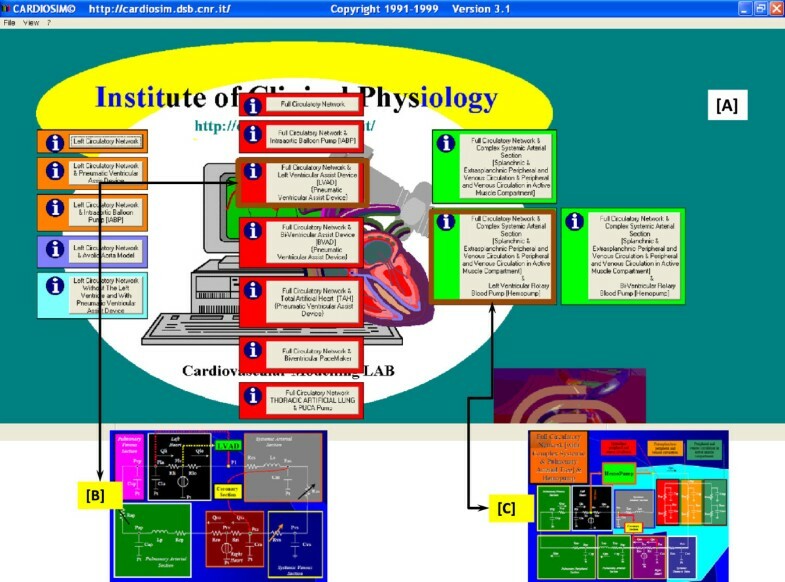 CD developed the numerical simulator CARDIOSIM© using Visual Basic program language. In this work he implemented the numerical model of thoracic artificial lung (TAL). He organized, coordinated and participated in the realization of courses for the students. He acted as a tutor during the use of CARDIOSIM© by students. He analyzed data obtained from simulations and joined the evaluation of the questionnaires produced by students. He drafted the manuscript. IG organized the questionnaire and participated in the realization of courses for the students. He explained to the students the theory on the cardiovascular system and the use of TAL. He set up the questionnaire and analyzed data obtained from simulations. DMP participated in the realization of courses for the students. He also acted as tutor during the use of CARDIOSIM© by students. He analyzed of data obtained from simulations. He drafted the manuscript. AD explained to the students the theory on the cardiovascular system and the use of TAL. She acted as a tutor during the use of CARDIOSIM© by students. She set up the questionnaire. She analyzed data obtained from simulations and joined the evaluation of the questionnaires produced by students. FF explained to the students the theory on the cardiovascular system and the use of TAL. He hold the introductory lesson of the course. He analyzed data obtained from simulations. He drafted the manuscript. All authors read and approved the final manuscript.